- On the 2 wire connector, the green wire does not show continuity to ground, but I cannot find where it comes out of the wiring loom to test continuity of the wire itself. The Red wire powers the Blower Control Module and should be battery voltage. On the 4 wire connector. Black/Red is the output voltage to the Blower Motor. Brown wire is the variable voltage from the HVAC Control Head. drop on the Brown wire. 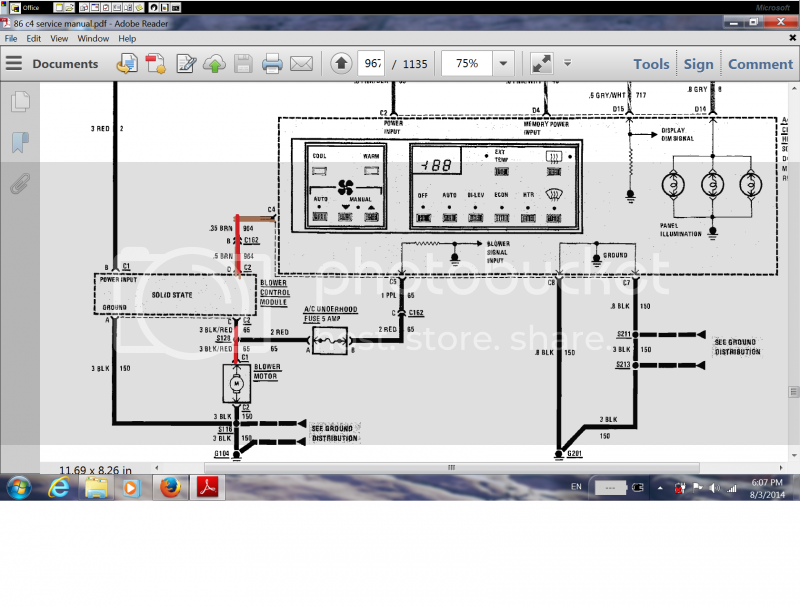 If no voltage on the Brown wire, the HVAC Control Head is bad. wire, the Blower Control Module is bad. When I do the measuring, can this be done with the 2 and 4 wire plugs disconnected, or do I need to back probe the wires to get them to read correctly? Back probe the connector wires. Stick red probe on brown wire. Black probe on Black wire. Manually vary the fan speed. Zero volts on the Brown wire when Off. which goes to the Blower Motor. On the 4 wire connector, with the HVAC on "ECON" and the fan at "10", I measured 234 millivolts between the thick black wire and the thin "black" wire which I assume is the brown wire. Also, on the 2 wire connector, with it disconnected it shows battery voltage with the car off, and 0 volts with the car and HVAC on. Is that normal? The red wire goes directly to the positive battery cable on the starter solenoid (though a fusible link), so it has 12 volts on it all the time, ignition on or off. If there is zero volts on the red wire then there is something wrong (probably fusible link is blown). The large black wire with the red stripe should be around 12 volts when the fan is at 10. That is measured with respect to ground, which means a metal part of the engine or the frame. That wire goes to the blower motor. 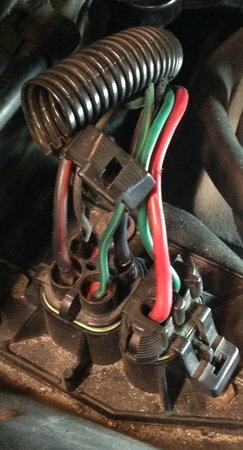 My car only has the one wire connected to the blower motor connector and a separate ground wire. I have seen later versions that have a 2 pin connector on the blower motor. Last edited by Cliff Harris; 08-04-2014 at 05:06 AM. Looks like you popped the cover off of the 4 pin connector so I assume when you are probing the wires you're making good contact? If you unplug the four pin connector. you should measure around 10 volt DC on the Brown wire. If you do that indicates the HVAC Control head is good. No voltage the Control head is bad. That leaves the Blower Control Module or the wiring. The Red/Black wire appears to be burnt. That wire powers the Blower motor. that wire does the Blower Motor run at full speed? If it doesn't the wiring is bad to the Blower motor. If the Blower Motor runs it points to a bad Blower Control Module. to the Black wire which is ground. Thanks for all the advice. I t looks like the control module is bad. The fan will run with 12 volts applied to the Black/Red wire. I have ordered a new module, and will report back when I have it installed. The Blower control module arrived today. I just plugged it in and turned on the fan, and it fixed the problem! It did remind me how bad off the blower bearings are, so I will order a new blower fan. I am very happy to have a working fan as the State of Virginia requires that the defroster be operational in order to pass the annual State inspection (which expired on my 86' at the end of July).